QUESTION: There was a recent posting at a mailing list with a Clan of Tubal Cain member mentioning the whole section of the 'Basics of the Craft' - Blessing of Wine and Bread, the cosmology of the four brothers, the drawings are not by Robert Cochrane - rather the Blessings are written by Phil Wayne (something like that, though I cannot remember the exact spelling) and the rest of the section was written by Mara - which I noticed from your page is one of your initiates in the 1734 tradition. Would you like to clarify this point? The person who made this statement was Dave Finnan from Ancient Keltic Church who I've observed from your postings in Metista is not regarded highly in your eyes. Yet I suppose some clarification on that part would help. ANSWER: David Finnan is mistaken. Mara contributed absolutely nothing to any of the material that is on this site. At one time she did make new sketches of some of the drawings, but I did not use her illustrations on this site. Also neither she nor I nor anyone else wrote the material that is attributed to Roy Bowers other than the man himself. Perhaps David misunderstood some of the things she said to him. Norman Giles gave the section you identified to me in 1970. He claimed that it was all written by Roy Bowers alias Robert Cochrane and I have no reason to doubt him. It's rather obvious to me why people who want Roy's system to have been "Celtic" would like to think that section and the " Prayer to Wine and Bread " were not written by Roy. It's rather obvious that the mythos he used in the "Herewith is the basic structure of the Craft ....." is not from any of the 6 Celtic nations. 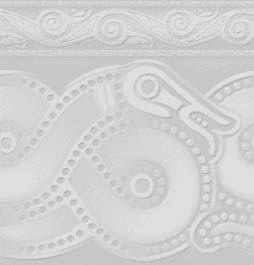 It has as much Germanic influence in it as it does Celtic, and is in general an exercise in creative mythologizing. .....what you have sent me is, as you indicated you thought all along, a fake. It is a rather scizoid amalgam of Welsh, English in pseudo archaic spelling and a few words of French and Spanish thrown in for good measure. I will break down the first sentence or two as an example. I don't think it merits dissecting it further than that. Madam la Guiden - "madam la" is poorly spelt French. Guiden, I take to be an attempt to invent a feminine form of the English word "God" so that it looks old. "Thi beth" is an invented spelling for "Thee be-eth" (a form of to be that as far as I know never existed). "Clad" is clad. It is not much used in 2002, but is still a part of modern English. "Et" is the Latin for "And" and is substituded here for "in" and "gwynn" is the Welsh word for white. The second sentence comes out, using modern spelling to sound like "Thee art freyed (damned if I know where this word came from) to be con (Span. for with) und (German for and) Kyth (I assume to be the same as kith in modern English). Other words grabbed at random include cotydiar (possibly Cotidiano - "daily" in Spanish), Houzle which may be Hassle or Hoosie (Scots English for house). In short it is a rather bizarre fabrication. I might do better, but older forms of English are not my strong suit and I suspect whomever is responsible for this spent a few days with a Middle English reference dictionary or at least a highschool copy of The Green Knight and Canterbury Tales. However, they did not know enough to get the grammar or the verb forms down and why they would combine words from Welsh, French, German and Spanish is beyond me. Frankly, if I were Phil Wayne I'd be embarrassed to have people claiming that I wrote anything like that. David Finnan has been taking pot shots at me for over 20 years. I pretty much ignore him since it's my view that those who accept his word without checking sources aren't people I'd care to associate with anyway. Still, I will clarify things when people ask me. Thank you for asking. QUESTION: Does 1734 include/follow the Wiccan Rede -- "An it harm none, do as you will?" ANSWER: No. None of my sources (Ruth, Roy, or Sean - or Norman, for that matter) went by the Wiccan Rede. Nor did I follow or promote the Rede as part of 1734. The system has its own distinct set of ethical guidelines. Some people and groups who call themselves 1734 do include the Rede as part of their beliefs/training. That's fine, but it should be understood that these are personalized additions made by that group, for that group -- it does not make the Rede part of 1734 itself.